Originally published in 1833. We can't state that this book was a best-seller by today's standards but in The Mother's Book, the author proudly states that it sold 6,000 copies in its first year. In that same source, she mentions that its target audience was "the middling class." 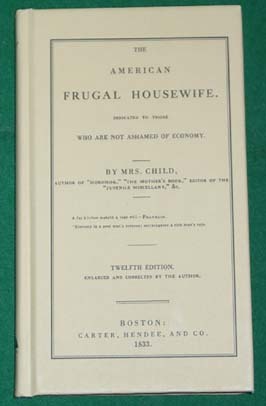 Besides recipes the book also contains numerous guides for frugal living. The introductory chapter lays out the philosophy which paraphrased might consist of the rules to do it yourself, make it do, fix it, and use it till it can't be fixed and then make a practical use of the scraps. There then follow a collection of recipes intermixed with instructions for food preservation and general tips for food preservation. As with the general theme of the book, the recipes are basic wholesome cooking with nothing showy or fancy. The modern cook wanting to try any of the recipes will have to accommodate the dearth of specific instructions, e.g., "For a cherry pie - Cherry pies should be baked in a deep plate. Take the cherries from the stalks, lay them in a plate, and sprinkle a little sugar, and cinnamon, according to the sweetness of the cherries. Baked with a top and bottom crust, three quarters of an hour." Nothing about quantities of ingredients, cooking times, or even directions telling you to remove the pits from the cherries. You're just supposed to know. The book concludes with "maxims for health" and "hints for persons of moderate fortune."